Imagine if you had never stayed in a hotel, and we promised to tell you everything that you needed to know about hotels. With so many different types of hotel, it would be a near impossible challenge. When you wake up, your ship has already docked: a new day and a new adventure begins. Open the curtains in your spacious bedroom and take in a breathtaking new vista. Maybe it's warm enough to enjoy breakfast with the view, on your balcony. Or maybe you would prefer to have it in your living space, or take it in the ship's breakfast rooms. 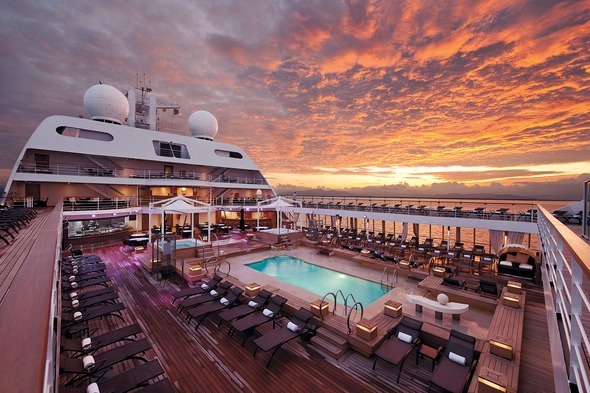 Choice is everything when it comes to luxury travel, and on a cruise you really do have a choice about everything. Breakfast over, what now? The ship is yours for the day if you wish. Maybe time to luxuriate in the spa, with a specialist massage. 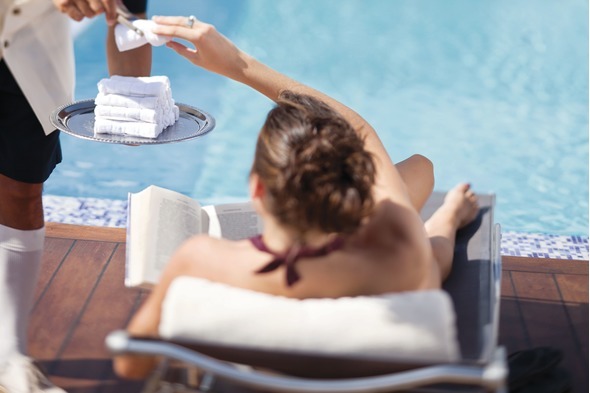 Take a book on to the sundeck, whilst attentive stewards look after your every need. Or if you prefer, you could work out in the gym, swim, or play tennis. 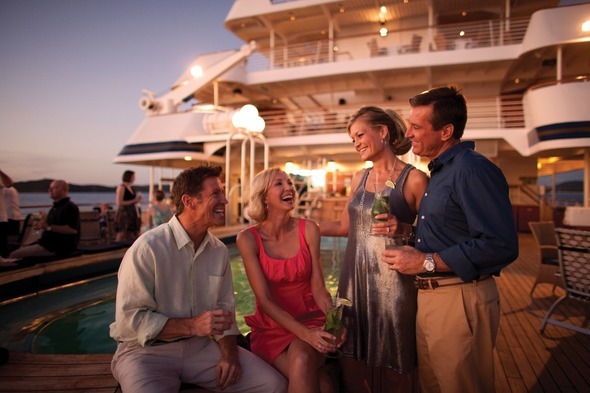 Lazy days, active days; all days spent on board can be wonderful days too. But in port, most will choose to venture ashore, either on their own or with a small group of other passengers on a tour of key sights. 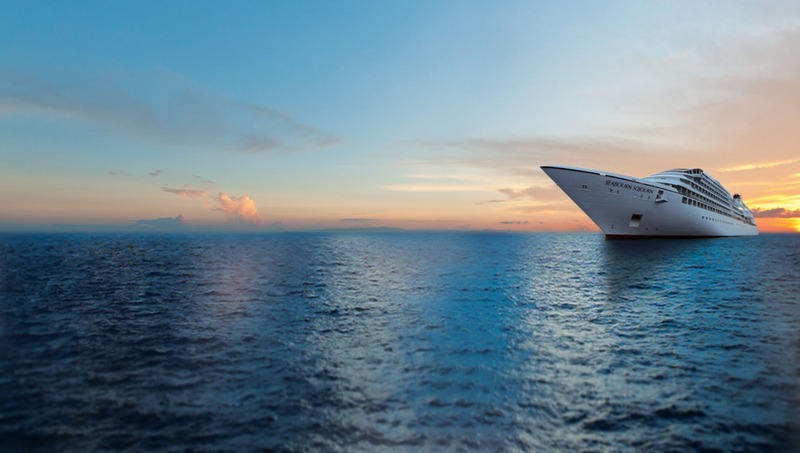 Matchless choice is the watchword of travelling on ships: you are your own master if you wish, or you can leave it to the ship to arrange your shore excursions. The problem is never that you're short of things to do; if anything, it's that you have too much choice! Return to your ship at leisure, but it might be a grave mistake to miss dinner. 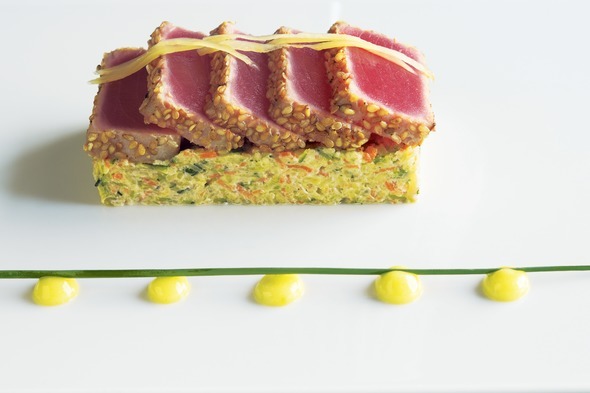 At the top end of the market there is always a superb choice of opulent restaurants on board, and within them a fine array of magnificent menus, often prepared by world-famous chefs and complemented by world-class wine lists. Dinner is always guaranteed to be a fine event, whether you have chosen a ship that prefers a casual style, or one that also offers a formal dining choice. And after dinner? Wander ashore, if the ship hasn't yet set sail, or take a glass in hand and enjoy the view if it has. Or take in a film, or a cabaret. Perhaps you prefer a casino, or simply staying up to chat under starlight. It's all about personal choice. Which is why the only typical day is the one that you choose. And whatever you decide, you can be sure it will be fantastic.